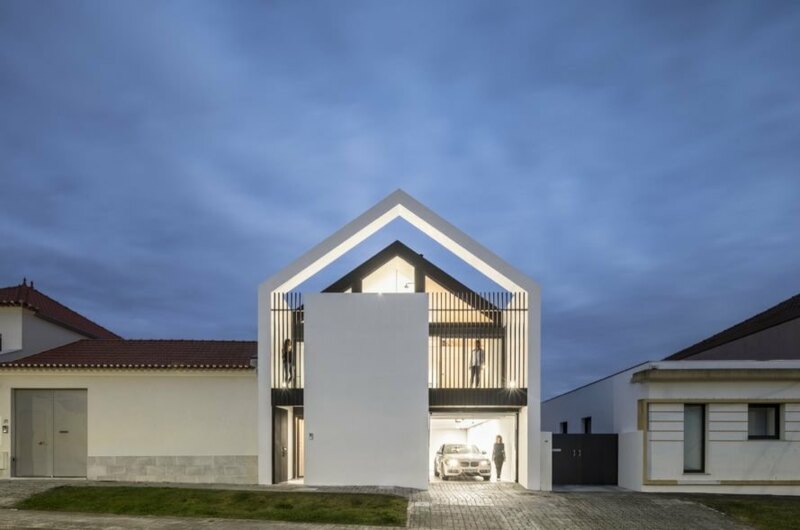 On the outskirts of Ílhavo, Portugal, architect Maria Fradinho of the firm FRARI – architecture network recently designed and built her own industrial-inspired home and office using a modern and playful house-within-a-house concept. Sandwiched between two red-shingled homes, the contemporary abode stands in stark contrast to its more traditional neighbors. 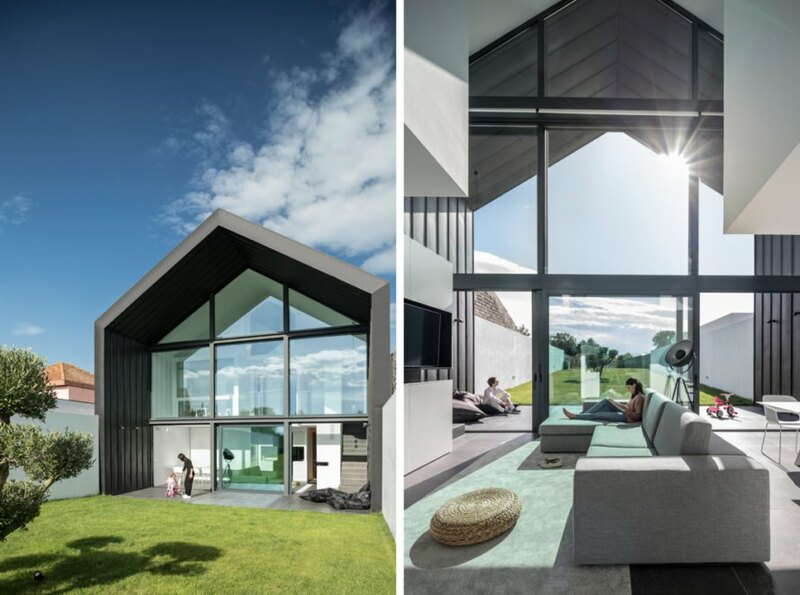 Dubbed the Arch House, the dwelling was named after the “theatricality” of its facade, a simple gabled shape with strong geometric lines and massive walls of glass. The Vista Alegre Porcelain Factory, one of the region’s most important industries, inspired the Arch House design. As a result, the home features a sleek, black, metal-clad exterior. In contrast, the interior is dominated by white surfaces and filled with natural light and strategic views that give the rooms a sense of expansiveness without sacrificing privacy. Full-height glazing also pulls the outdoors in, while indoor-outdoor living is emphasized with a covered patio that spills out to the backyard. 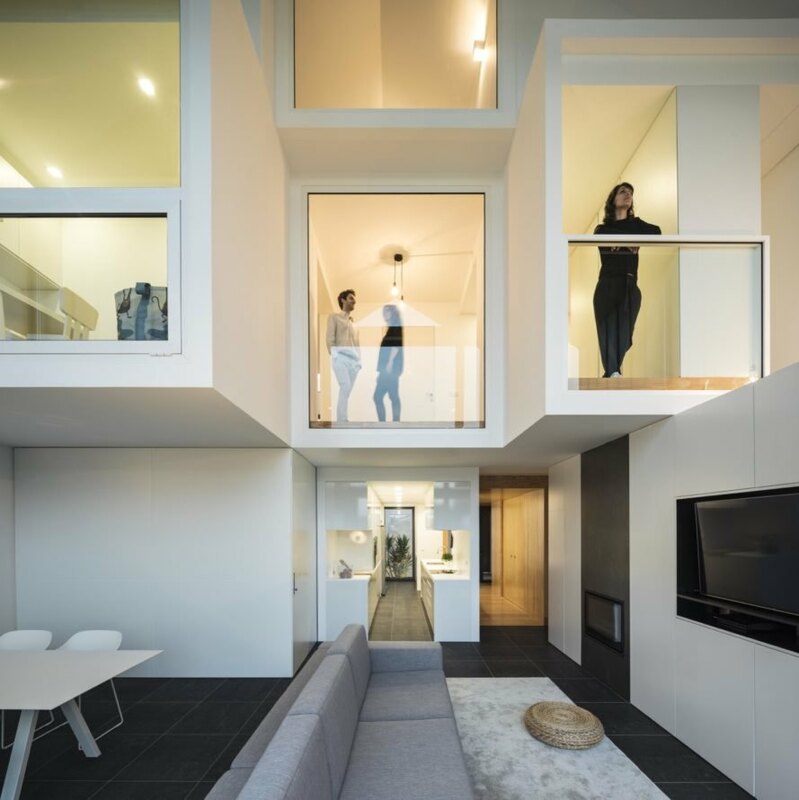 A house-within-a-house concept is explored with the insertion of shipping container-inspired stacked volumes, each faced with windows, which overlook the indoor living room on the ground floor. 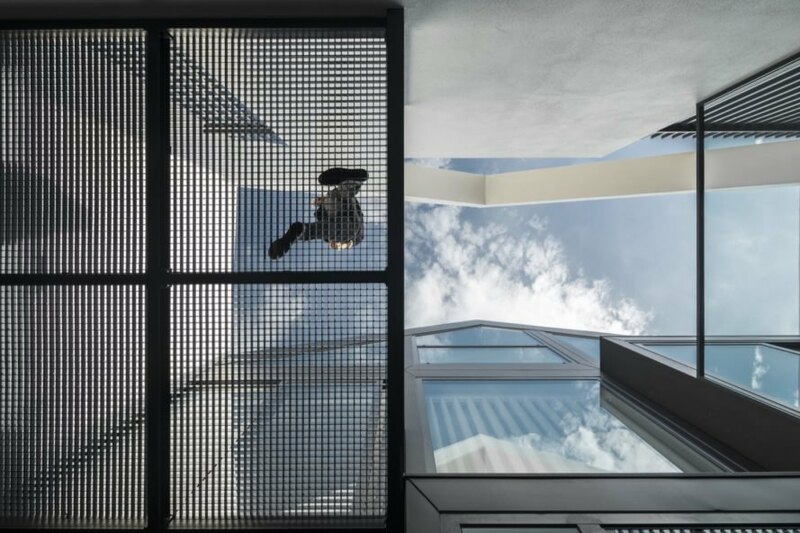 Spanning an area of 300 square meters, the Arch House occupies a little less than a third of its long and narrow lot. The home is spread out across three floors and includes a basement. 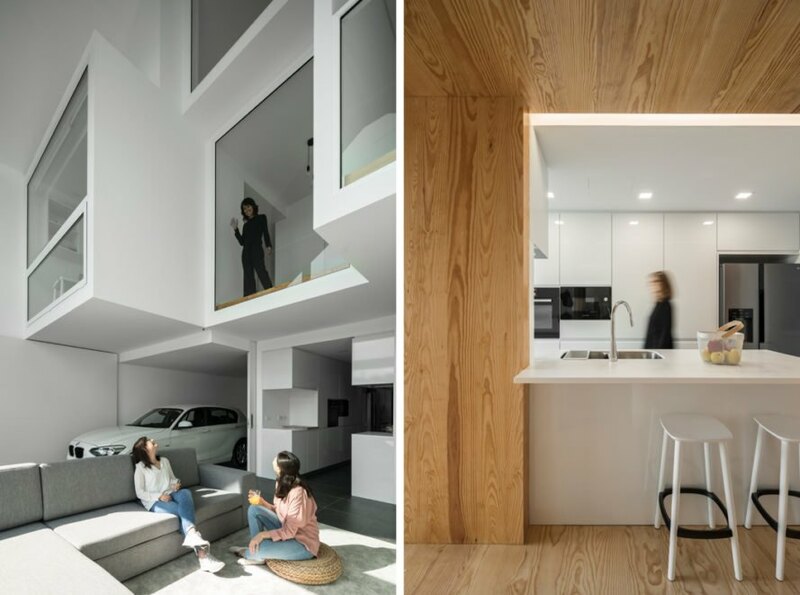 The open-plan ground floor houses the primary communal spaces, including the living room, kitchen and dining space, while the private areas are located above. Maria Fradinho designed her home and office in Portugal. She drew inspiration from industrial design. The home's gabled shape and bold lines keeps it simple while still allowing the structure to stand out. Natural light and indoor-outdoor living are emphasized throughout. 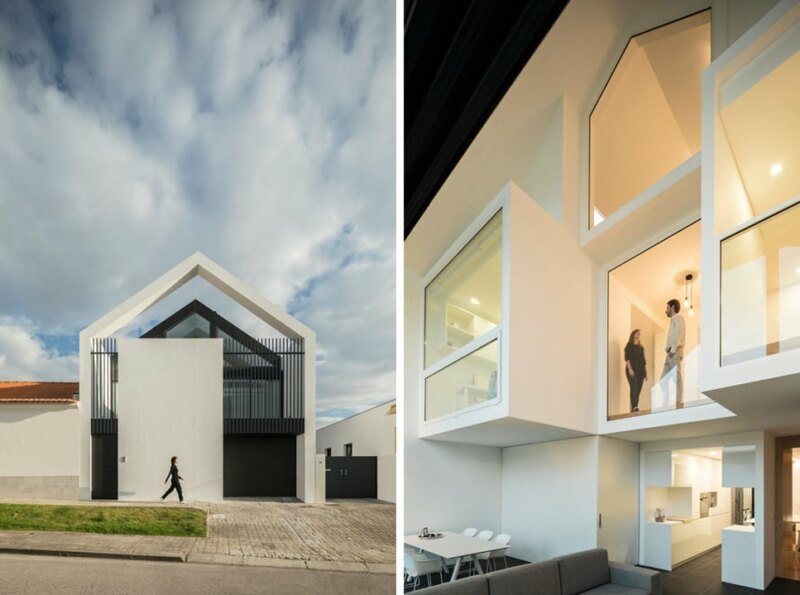 The home's dark exterior contrasts with its bright white interiors. An array of windows allow light into the home. The design is also inspired by shipping containers.